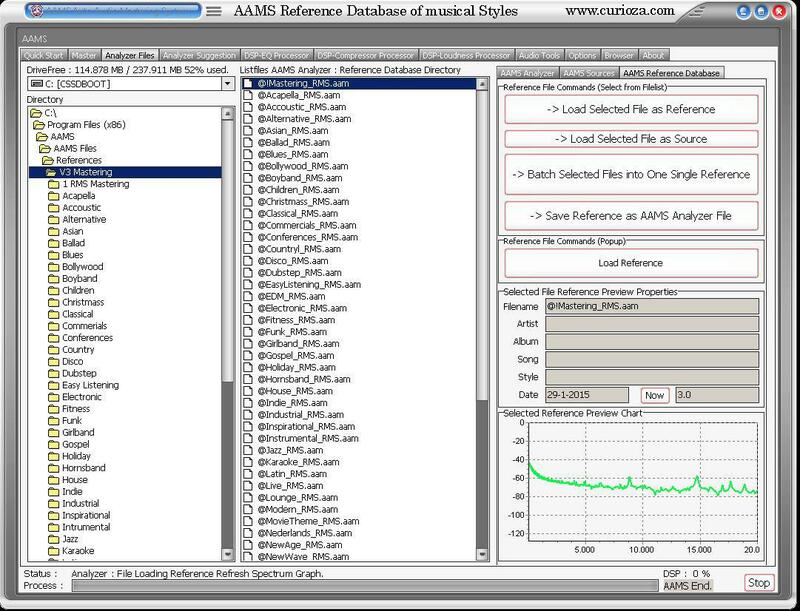 The AAMS V3 Reference Musical Database is an important part of AAMS software! AAMS is reference style based. The source is your own audio track. The reference is what you want to sound alike as the AAMS reference database is explained below. When both are chosen AAMS will do the audio mastering for you! The reference style a user can choose is the way you want your tracks to sound alike Pop, Rock, House or any musical genre, or any band, artist or recording. It is even possible to batch references as one, to mixup, bring together styles. The matching between source vs reference, your music and your music sound as mastered by AAMS according to the reference. It is even possible to combine and batch musical styles together and adjust edit towards your own sound like EQ but then with the frequency spectrum! Adjust References alike using EQ and save them for later use. AAMS works with a Source file (your audio) and a Reference File (out of the AAMS Database of Reference Styles as pre-installed) or creating your own references. AAMS does compare source against reference. You can also create new references out of the database or out of analyzed tracks, albums and other audio. The reference database is updated out of 38.0000 tracks and contains most of successful, commercial and many more quality music references styles. The older AAMS V2 database is also installed with AAMS V3. Watch the video for instructions how to use the Reference's and also to create your own presets. The Reference Style Database of AAMS version 3 is completely and newly written. We have AAMS Analyzed about 38.000 Tracks of Music from different Genres and Styles. From everywhere over the world, for you to compare your music against. Your own audio material is called a Source. What you compare your source with is called a Reference. So what AAMS Software Analyzer does is compare your music and creates Suggestions from making it sound as good. Then AAMS will master your music accordingly! The main function of the Reference Style Database is to give the user a readymade preset database of musical styles to compare and choose from. These References are specially crafted AAMS Analyzer files made by interpreting musical styles and contain frequency spectrum, compression and loudness levels, functions that AAMS Software can understand. As a Source is an AAMS Analyzer *.aam file. A Reference is also an AAMS Analyzer *.aam file (mostly an @ is used in the filename for references). The Style or Reference Database is installed with AAMS. 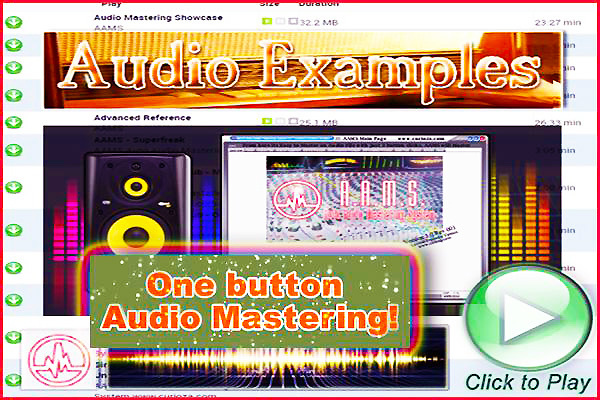 Inside this directory are all RMS files and they are suitable for most mastering purposes and for beginners to work with ease in mind. The full Reference Database has got with the Styles a lot of varaitions. Like male or femake (voice), fast or slow (beat) and contians about 300 different references from music styles all over the world. 'V3 Mastering' with AAMS V3.0 main Reference Database files (for AAMS Mastering). 'V3 Mixing' with AAMS V3.0 Reference Mixing Files (for Mixing etc). RMS means root mean square and are named RMS in the style name. The main starting References for Beginners and for All Mastering functions that are general. If you do not know what reference to choose but know the gerne. 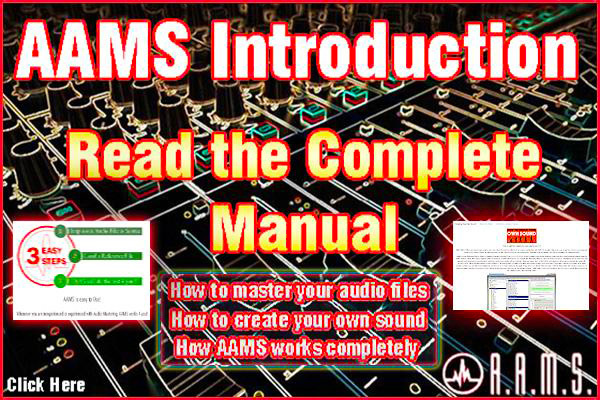 '@AAMS Mastering_RMS' – The main starting Reference for all beginners and lazy users. Eh ahum, yes this is the AAMS RMS main reference, if you are new or a beginner, just just want a good steady sound, start with this reference. The Mixing database is highly experimental, because Mixing Tracks with AAMS Mastering Software is kind of under construction. But we like to give our users a hint what is coming up in later versions of aams and we would not underestimate our users for experimenting with this Mixing Database. 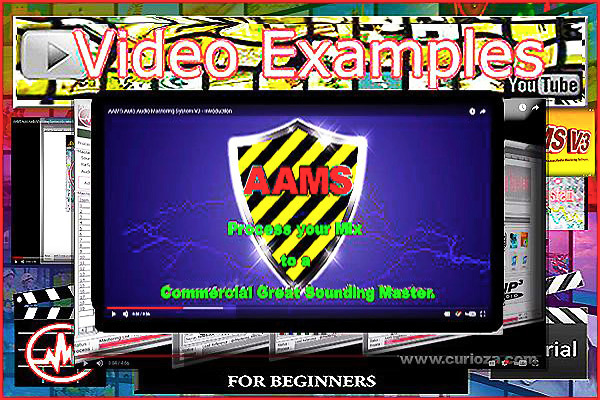 This database is not generally used for Mastering purposes with AAMS. As a Source is an *.aam file. A Reference is also an *.aam file (mostly an @ is used in the filename for references). The Style or Reference Database is installed with AAMS V3, usually in C:Program FilesAAMSAAMS FilesReferences or C:Program Files (x86)AAMSAAMS FilesReferences. Inside this directory are all RMS files and they are suitable for most mastering purposes. The full database is in the following directory C:Program FilesAAMSAAMS FilesReferencesReference Database. The database was rewritten 21-12-2018. All Files are copyrighted (C) 2004-2019, Sined Supplies Inc.
(Read the license agreement for details about copyrights etc). Included into AAMS V3 is the older Reference Style Database as AAMS Versions from AAMS V2.5 Rev 006 to even AAMS V1.0. The older References can still be used and loaded as Reference Style. Though the later AAMS V3 New Reference Style Database cannot be loaded into older AAMS V2 or AAMS V1 versions. 62 @New Wave RMS.aam - New Wave RMS.